Crime Watch: MURDER IN THE SECOND ROW: another Kiwi crime fiction debut! 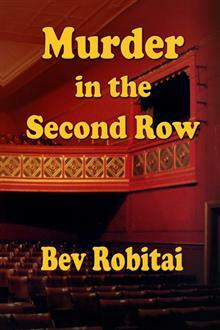 MURDER IN THE SECOND ROW: another Kiwi crime fiction debut! I was trawling around the Internet in the past couple of days, looking for some New Zealand crime fiction-related content, when I stumbled upon another New Zealand-based author who had published a debut murder mystery this year. "There are many things that can go wrong between casting a show and Opening Night. Finding a body in the second row is just one of them. Jessica Jones is well aware that the old Regent Theatre is at crisis point. As theatre manager she is responsible for most of the productions staged there, and this show is the last chance to prove that the place can make enough money to be worth saving. Rehearsals begin, and it’s not long before hot little Tamara Fitzpatrick is distracting all the guys under 70 with her wicked ways. Someone disapproves, and Tamara is found dead in the auditorium after the promotional photoshoot. Now Jessica has to cope with finding a replacement for Tamara, and finding a new rehearsal venue. And as if life wasn’t complicated enough, Jack Matherson, the police officer heading the investigation, seems to be taking an unusual interest in her." There is of course a great tradition of mixing murder mysteries and the theatre. Our very own Dame Ngaio Marsh, who was awarded her "damery" for services to theatre - she played a strong role in resurrecting the flagging theatre scene in New Zealand, set several of her Inspector Alleyn mysteries in theatre-related locations. I am currently reading MURDER IN THE SECOND ROW, having purchased an ebook copy on Smashwords (a good option for overseas readers of Crime Watch; it's available at a very reasonable price there). For those in New Zealand who'd like a hard copy of the book, I understand that Borders Albany is stocking the book, and it is also available for order from online booksellers Wheelers. It's great to see more New Zealand-written crime fiction hitting booksellers shelves (online and physical). Maybe it's just my skewed perspective, but I really do think we have something building here downunder, and its great to see. Do you like the sound of MURDER IN THE SECOND ROW? Do you like murder mysteries set in the world of theatre? If you've read it, what do you think? Thoughts and comments welcome. Sounds like an intriguing mystery. I'll certainly be adding it to my list of books to read of the summer. Who is the publisher Craig? On the Wheelers online bookstore website the imprint is noted as 'Mackay Books' Graham. I'll try to get in touch with the author and find out - I'm guessing it's a small publisher/self-publisher perhaps? It's not a long books, but I'm finding it more and more interesting as it goes on. It does give you a good 'peek behind the curtain' of the world of amateur theatre, and has some interesting characters.